BMW has released the full specification of its X5 xDrive40e Plug-in Hybrid Electric Vehicle (PHEV), which boasts 77g/km CO2 and 85.6mpg combined fuel economy. It goes on sale in autumn 2015, with prices expected to start at around £55,000. 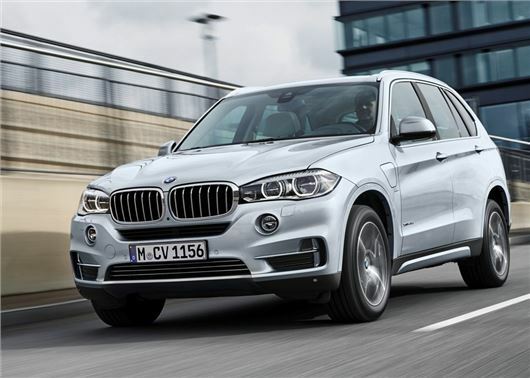 The most efficient BMW X5 ever, the SUV links a 245PS four-cylinder, 2.0-litre turbo petrol engine to a 113PS electric motor, equating to 313PS and 450Nm to all four-wheels. The 0-62mph time is 6.8 seconds and top speed is limited to 130mph. The lithium ion battery pack that feeds the electric motor is housed under the boot, reducing load capacity from 650 litres to 500, although no cabin space is lost. Like other plug-in hybrid electric cars, the X5 xDrive40e can run on battery power alone, for up to 19 miles at up to 75mph, and can be charged either using a regular household supply or a special BMW-fitted fast charger, called the BMW i Wallbox. A full charge will take around four hours via a regular plug socket, while the i Wallbox will take two hours and 45 minutes. Power is channelled to the wheels through an eight-speed automatic gearbox and BMW boasts that the X5 is all-wheel drive even in all-electric mode. Three driving modes are switchable: Auto eDrive, Max eDrive and Save. The first works out what the driver wants based on throttle movement, with electric-only mode engaged unless the driver presses the right pedal hard, or hits 44mph, at which point the petrol motor kicks in anyway. In Max eDrive mode the car simply sticks with the battery until it runs out (or beyond its 75mph capability), and in Save mode, the petrol motor is tasked with recharging a flagging battery. Other than the sophisticated drivetrain, the BMW X5 PHEV is as per any other X5, albeit with some switchgear and graphical displays specific to its hybrid functionality. Standard kit includes self-levelling rear air suspension, damper control, dual-zone climate control, navigation, DAB radio and cruise control. Buyers cannot specify the seven-seat option available with other X5 models, however.